Unlike previous Devil May Cry games, DmC Is capped at 30 frames-per-second. There's plenty of reasons to be leery about the upcoming Devil May Cry not-quite-a-reboot. The radically different art direction, the liberties it's taking with the series' lore or the fact it's being developed by a Western studio not known for its compelling combat design. 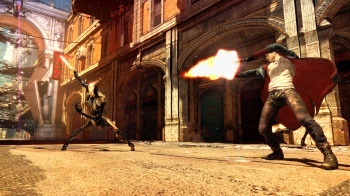 But while it remains to be seen if those factors will make or scuttle the game, there has been one change that's a clear downgrade: Previous Devil May Cry games ran at 60 frames-per-second, the new game runs at 30. Now to some people, especially the crowd of hard-boiled enthusiasts who make up Devil May Cry's core fan base, that's a huge deal. The difference between 30 and 60 FPS is perhaps subtle to the untrained eye, but pick up a controller and the two framerates are like night and day. Or perhaps not, as director Hideaki Itsuno told Eurogamer. "60 FPS is a speed the brain and the eye can catch up with and understand," he said. "But at 30 FPS there's a technique where you take advantage of the brain's ability to fill in the blanks. So even though you have it running at 30 FPS, you create the motions and the poses in such a way that the brain will naturally fill in what would have been the extra frames." Itsuno pointed out that 60 FPS would be "better," but went on to claim that long gaming sessions at higher framerates have a tiring effect on payers' eyes because the frames "almost shake or flash." "Adjusting the speed is almost necessary," he added. According to DmC's technical art director, Stuart Adcock, the game's lowered framerate is down to its engine - the game is using the UE3 engine rather than Capcom's in-house MT-Framework - and the fancy level-shifting shenanigans you can see in this trailer. The PC port will apparently run at a solid 60FPS, making it the version of choice depending on release date and port quality. Still, Capcom and Ninja Theory think they've included enough visual and technical tricks to emulate a 60FPS level of responsiveness. I guess we'll find out if that's true when the game hits consoles next January.